FIRST LOOK… OR NOT TO FIRST LOOK? First looks are one of those things most people either absolutely LOVE the idea of, or totally despise it. So, I wanted to write a post about the pros and cons of doing a first look. In all of my consultations and timeline consultations I typically discuss the pros and cons, but there may be people out there that are curious about why I generally try to push the first look. What you decide for your wedding day is ultimately up to you as a couple, but hearing both sides may help you make your decision. Most of my Brides and Grooms want to get to celebrating ASAP! They want to enjoy the wedding with their friends, family and each other. 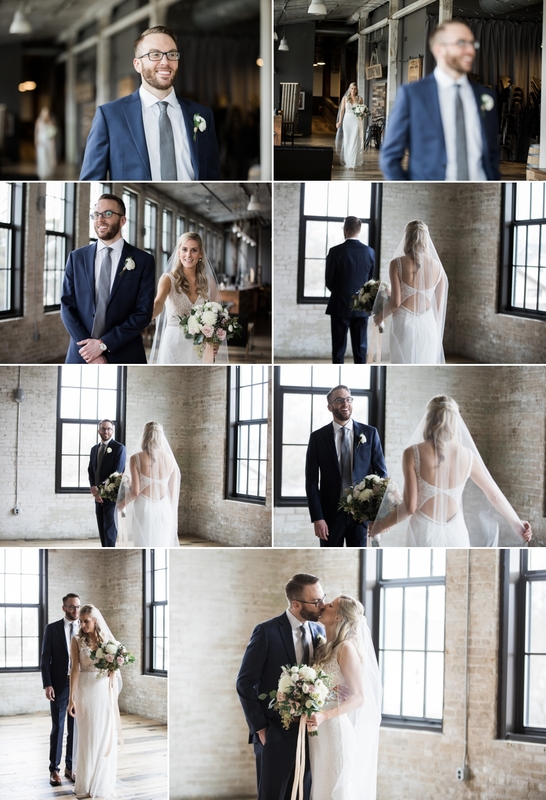 Doing a first look allows you as a couple to get all of your photos done BEFORE the ceremony. This leaves time for the two of you to celebrate your nuptials with your wedding party in a private cocktail hour, or some of my couples even like to join the guests in the main cocktail hour. The choice is yours. When you don't do a first look, right after the ceremony and send off, you will head off to do family photos for 15-20 mins then rush into the full wedding party photos and maybe have 30 mins leftover for the two of you before your introductions into the reception. It leaves less time for creative images which truly capture your love and relationship. Don't get me wrong tho, it CAN be done, and it WILL if necessary. Contrary to couples belief, the feeling you get walking down the isle is still there. It does not go away like you would think it would after doing the first look. You will still have that "here we go" nerves and excitement as you walk down the isle to her man. For an anxious bride or groom the first look is an amazing way to calm the wedding day jitters. You as a couple have been planning this day for months, even years in some cases. You are hoping everything pans out the way you have hoped it would and you are anxious to get the day rolling and to see your husband/wife. 99% of my couples who choose a first look tell me that they are so glad they did it because it helped them relax and enjoy the day more with their loved on by their side. Yes! We all want more right? Doing a first look allows you to structure your day around the photos that you want. You get more, you are not rushed and you can have those creative images you desire. You can pick multiple photo locations, all you have to do is schedule the time as you want it. No guests are waiting for you, you can take breaks, relax, have a beer (or wine) and enjoy the process. As an added bonus, since I am not shooting the bride and groom photos during the cocktail hour, this gives me time to capture candid photos of your guests mingling and also gives me time to capture any last minute reception detail images before the guests arrive into the venue. You have spent so many hours (and not to mention money) on picking the perfect details for your big day, I want to make sure every last thing is captured. Weddings are amazing! They are like massive family reunions. All of your closest friends and family, all in the same place at the same time. With that being said, if you don't do a first look, you will have no time alone with each other. I know, CRAZY right? Yes, you are standing beside each other for hours, but none of that time is alone time for you. When you do a first look you get to actually spend 10-15 mins, JUST THE TWO OF YOU! You can exchange gifts, read letters, and just enjoy each others company. At the first look I encourage my couples to not have anyone watch. It makes it more intimate, you get that special time. He gets to tell you how absolutely stunning you look and you get to hug, kiss and enjoy the moment. Right after the first look we move straight into your portraits so you get 30-60 mins of you time. Relaxed and enjoying the day. And… just as a reminder, don’t forget your DAD! He has been there forever and first looks with your dad is always an important moment in your wedding day!